Website redesigns for builders can take months, even years of hard work. And they often run over schedule and over budget. Then after all the waiting and disappointment you get to see your expensive new website become stagnant. It may go years without any major functional improvements, since you blew 3 years worth of marketing budgets already. There are many reasons why a home builder would need a new website. But just as often, it may be the case that you don't actually need a new site. You just need to breathe life into the one you already have. So, do you actually need a new website? Use the following checklist to determine if it's time for a remodel or an all-out teardown. Your website doesn't have a content management system (CMS). A good CMS gives you or your team to the ability log in and easily update floor plans, communities, homes & models. You don't have the ability to collect customer contact info. This functionality can be as complex as using an online sales team with full-on marketing automation, to a more simplified manual approach by an Online Sales Counselor. But at a very basic level, your site should have lead generation capabilities. In an ideal world, these leads get flowed directly into your Customer Relationship Management (CRM) system for a seamless handoff from marketing to sales. But those solutions can get pricey for smaller builders, in which case a manual entry from website lead into CRM works too. It doesn't work well on mobile. We've passed the threshold where more home builder website visitors are now on phones or tablets than desktop computers. Buyers shopping from their mobile devices not only have smaller screens, but they are often looking for different content than people sitting in an office or living room on a laptop. Mobile-friendly is now a must-have for home builders (and a mobile-first home builder website strategy is preferred). Your site looks completely outdated. Does your website reflect your brand and speak to your buyer’s tastes? If your site feels like it hasn’t been touched since 1995, buyers may assume your homes haven’t changed since then either. It may be time for a new website. Your site checks all the boxes above (in a positive way). 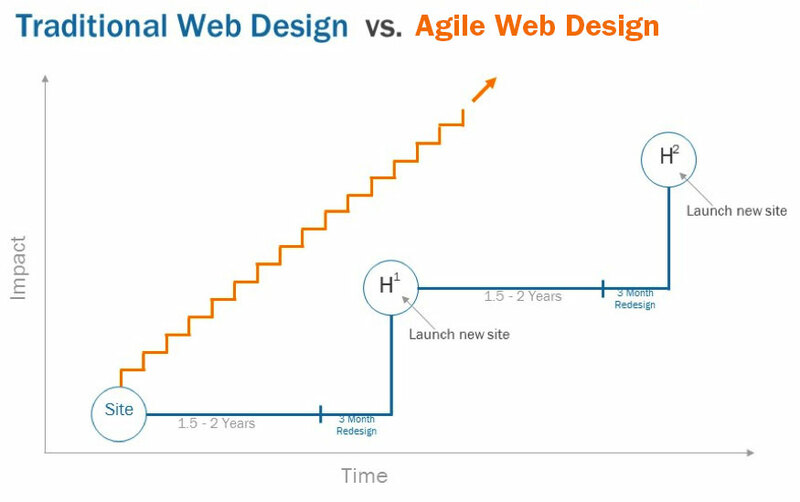 In this case, what you really need is an agile approach to improving your website. Agile is a method in which you start small, and make a series of improvements, called iterations, based on user feedback. Your end goal may be the same: a beautiful, easily-updated lead-generating machine. But getting there with an agile approach will be much faster and more efficient. 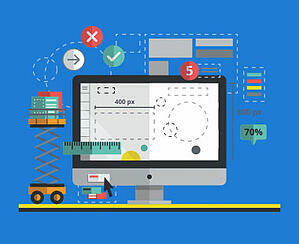 As with traditional web design, you begin the agile process with research and goal creation. Create personas (e.g. First-time Frank or Downsizing Donna) for the various users of your site, and conduct user research. Use analytics to explore how users arrive at your site, interact with it, and why they’re dropping off or bouncing. Feedback from your user base can paint a more accurate picture of how users view your site. What bugs or problems are users running into? Why do users come to your site? What key features or tools are users wishing your site had? Armed with these findings, you'll establish goals for your website. It's important that these goals are: a) specific, b) tied to company metrics, and c) measurable. Your current website may be accomplishing some of these goals already. Part of your strategy should include how you plan to track progress towards of each goal. Once goals and strategy are in place, you'll be ready determine what should be included in the MVP version (think of it as your launch pad web site). This part of the website strategy is a version of your web site that includes only the most essential features that accomplish the goals identified in the strategy phase. Your current website could be your launch pad, as long as it has the features we discussed in the checklist. The goal is to launch small so you can test, learn, and react before investing in a “big” design solution. User-based personalizations: customized calls-to-action, visuals, and contextually relevant product recommendations and offers. Be sure to set up experiments to test the impact of your enhancements. After launching new features, a crucial part of this phase is to take a step back and review the results. For example, when top 100 home builder True Homes approached us looking for a new website, we checked all the boxes above, and then used an agile approach to come up with an alternative solution to meet the needs of their buyers, one that didn’t involve the pains that go into a redesign. From there, we created a landing page strategy that aligned the goal of the builder (improve ROI of marketing budget) with the goal of the buyer (find a builder that offers the best value) on the very first visit. They saved time and money, and were able to launch, measure and optimize the website campaign in 30 days. To read more about the results, check out this True Success Story. Take an agile approach, and be confident you'll get the best ROI from your home builder web site. So the next time you're faced with the question: "do I need a new home builder web site?," don't be discouraged or intimidated. Implementing these 3 phases of an agile approach allows you to test, learn, and react before committing to a lengthy, costly project. 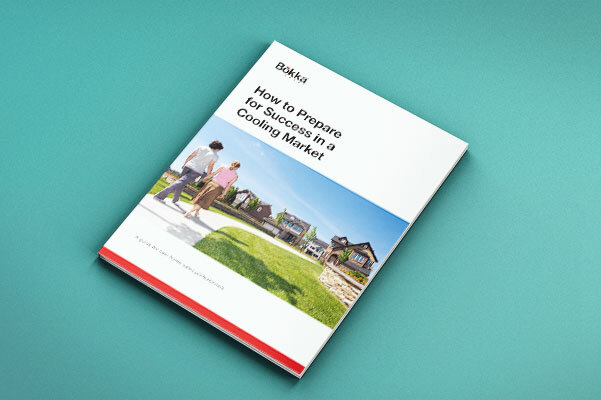 If you’re interested in creating smarter goals, connecting with customers, prioritizing improvements that launch sooner and get faster results, maybe it’s time to consider the agile method for breathing new life into your homebuilder website. Contact us if you’d like to learn more about how the Bokka Group can help you improve your website and your customer experience through agile digital marketing. If you'd like a PDF version of the checklist of requirements to print or reference later, enter your information to download it now.